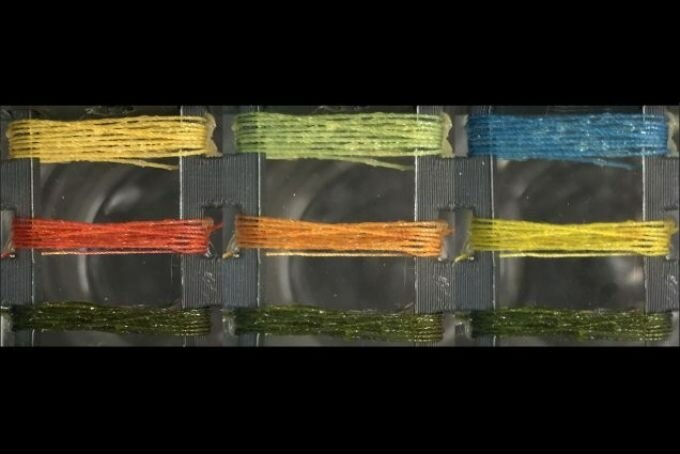 Engineers at Tufts University have formulated a novel fabrication method to develop dyed threads that change color when they detect a range of gases. The scientists showed that the threads can be read visually, or even more exactly with the use of a smartphone camera, to detect variations of color because of analytes as low as 50 parts per million. Woven into clothing, smart, gas-detecting threads could offer a washable, reusable, and inexpensive safety asset in medical, military, workplace, and rescue environs, they say. The research, published recently in the journal Scientific Reports, talks about the fabrication technique and its ability to extend to a broad range of dyes and detection of multifaceted gas mixtures. While not compromising the accuracy of electronic devices typically used to detect volatile gases, integration of gas detection into textiles allows an equipment-free readout, without the need for dedicated training, the researchers explain. Such a method could make the technology accessible to the overall workforce, or to low resource communities that can gain from the information the textiles deliver. The research used a manganese-based dye, MnTPP, methyl red, and bromothymol blue to demonstrate the concept. MnTPP and bromothymol blue can sense ammonia while methyl red can sense hydrogen chloride - gases typically released from cleaning supplies, chemical and fertilizer and materials production. A three-stage process keeps the dye “trapped” in the thread. The thread is first soaked in the dye, and later treated with acetic acid, which makes the surface to become coarser and the fiber to swell, perhaps enabling more binding interactions between the dye and thread. Lastly, the thread is treated with polydimethylsiloxane (PDMS), which forms a flexible, physical seal encompassing the thread and dye, which also repels water and stops the dye from leaching during washing. Notably, the PDMS is also gas permeable, enabling the analytes to reach the optical dyes. “The dyes we used work in different ways, so we can detect gases with different chemistries,” said Sameer Sonkusale, professor of electrical and computer engineering at Tufts University’s School of Engineering who heads the Nano Lab at Tufts and is the corresponding author of the study. Sonkusale’s team used basic dyes that detect gases with base or acid properties. “But since we are using a method that effectively traps the dye to the thread, rather than relying so much on binding chemistry, we have more flexibility to use dyes with a wide range of functional chemistries to detect different types of gases,” he said. The color of the tested dyes changed in a way that is reliant on and relative to the concentration of the gas as measured using spectroscopic approaches. In between the precision of a spectrometer and the human eye is the option of using smartphones to read out and measure the color changes or deduce color signatures using numerous threads and dyes. “That would allow us to scale up the detection to measure many analytes at once, or to distinguish analytes with unique colorimetric signatures,” said Sonkusale. The fabric even effective under water, sensing the presence of dissolved ammonia. While the PDMS sealant is hydrophobic and keeps water off the thread, the dissolved gases can still reach the dye to be quantified. As dissolved gas sensors, we imagine smart fabrics detecting carbon dioxide or other volatile organic compounds during oil and gas exploration as one possible application. Rachel Owyeung, Study Lead Author and Graduate Student, Department of Chemical and Biological Engineering, Tufts. Since recurrent washing or use underwater does not cause the dye to dilute, the fabric can be depended upon for reliable quantifiable detection a number of times over, the scientists said. This research was aided by a grant from the National Science Foundation Institutional Graduate and Research Traineeship (DGE-1144591) for R.O. Also contributing to this research is Matthew Panzer, associate professor of chemical and biological engineering at Tufts.